Nate and Princess each came from painful backgrounds before finding salvation with Bastrop Animal Rescue (BAR). 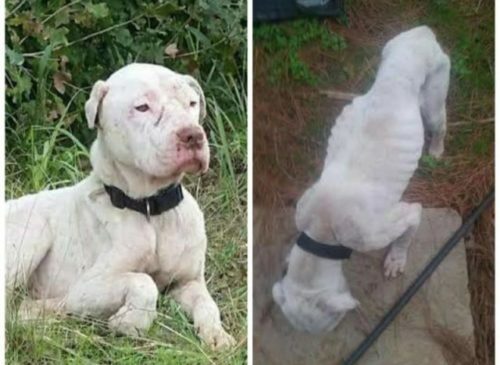 Nate was abandoned, emaciated, and covered in painful, infected injuries. Princess was hit by a car and required emergency surgery. 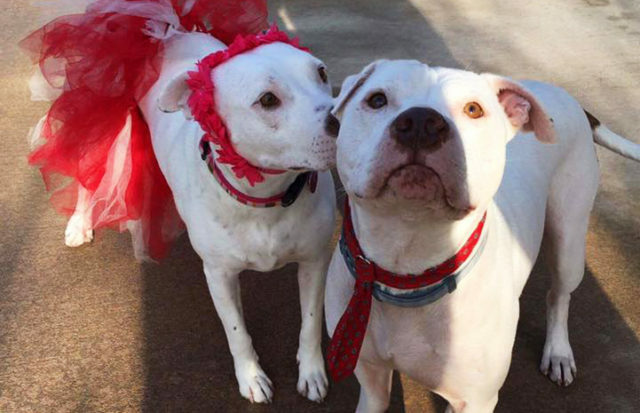 After overcoming their physical wounds, Nate and Princess were ready to heal their hearts. That’s where BAR community outreach director and experienced foster mom, Anne Ford comes in. She welcomed both pups into her home and is caring for them as they await their adoptive family. 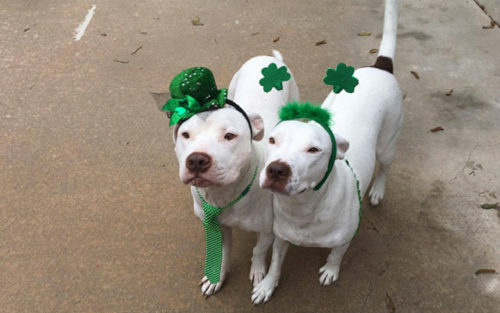 Both are snow-white bully-breed mixes with delightfully blocky heads, but that is where the similarities end. Nate is mellow, while Princess is boisterous. Nate loves bones and towy toys – Princess loves to steal them from him! Princess is also deaf, but it certainly doesn’t slow her down! Despite their differences, this adorable odd couple formed an instant bond. As wonderful as their time with Ford has been, Nate and Princess are ready to meet the family they will spend the rest of their lives with. 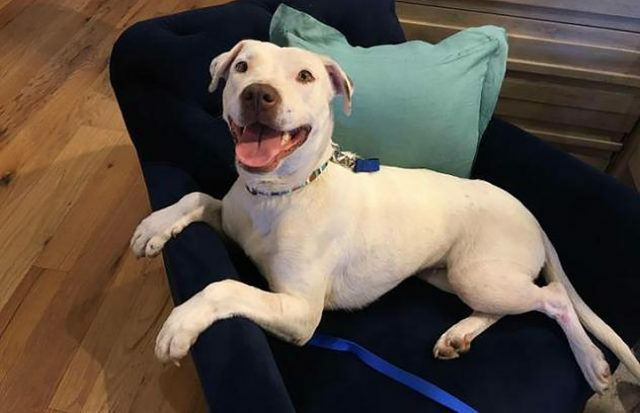 If you are searching for “a mellow guy who loves the cushy things in life” like “laying on super soft blankets, with his head on a pillow;” and an affectionate gal with a sense of adventure who loves belly rubs, car rides, and meeting new people, Nate and Princess may be the perfect pair for you! Learn more about this devoted couple and their “unfinished love story” at BastropAnimalRescue.org. Note: Many people ask why foster parents don’t simply adopt the animals in their care. The answer is that they are devoted to helping as many pets as they can, which would no longer be possible if they kept each one they fostered. 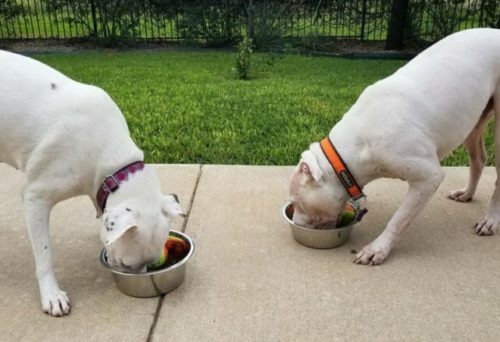 The post Canine “Old Married Couple” Is Searching For A Lovenest To Call Their Own appeared first on ILoveDogsAndPuppies.